Hiking in Tofino is popular for a reason. The hiking trails through rainforests and along the coastline provide amazing scenery unlike anything you may have seen. Welcome to the Pacific Rim, where Tofino is your base, and to many it’s both a haven and possibly the most beautiful place in Canada. 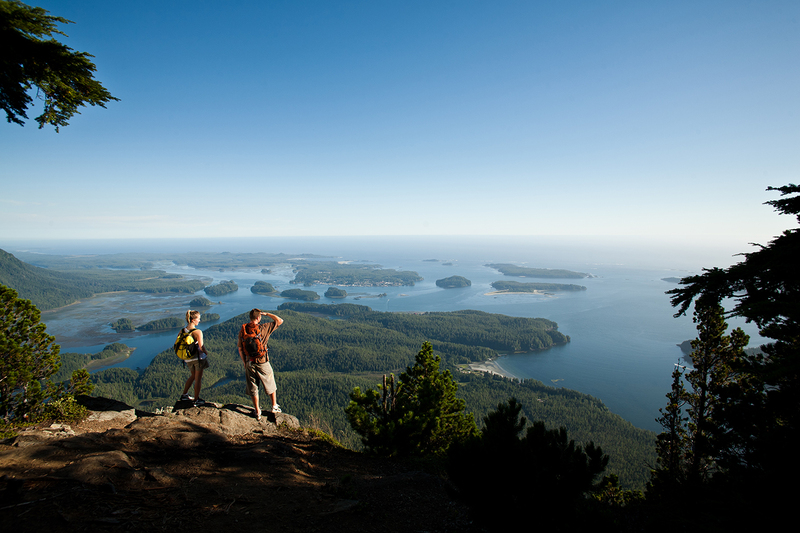 Allow us to be your guide to several of the hiking trails in Tofino that you should take in when visiting. Nestled in the Pacific Rim National Park is a forested boardwalk trail where words can not do it justice. Located between Tofino and Ucluelet, the Rainforest Trail is about 2 kilometres and has information signs about the history and life cycles of a rainforest along “Loop A” with details on the environment and the wildlife living in the forest along “Loop B”. Surrounded by lush forests of red cedar and western hemlock trees, it’s also home to a sea of ferns and moss and small wildlife that you’ll hear scurrying within the brush. 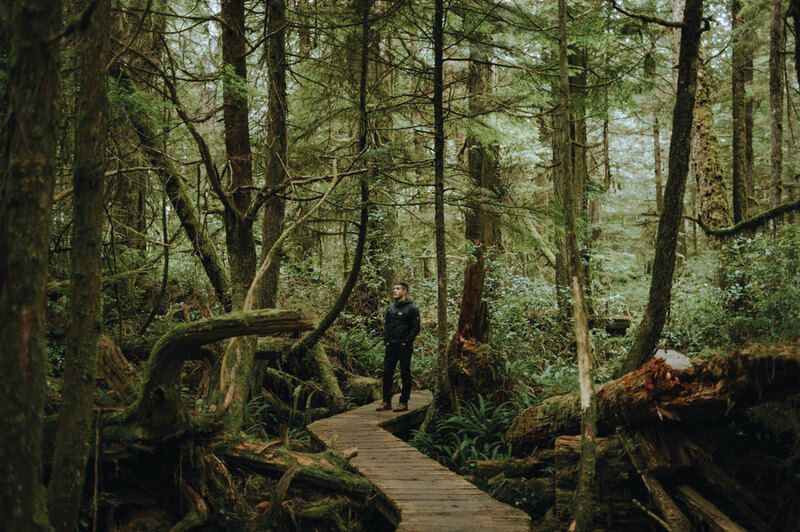 An essential part of any visit to Tofino, the Rainforest Trail is a spectacular way to spend a day. Also part of the Pacific Rim National Park is the Nuu-chah-nulth Trail that’s about 3 kilometres that includes some ups and downs and wooden bridges, crossing over small creeks and green swampy areas. It connects the coast to the rainforest and leads you to Florencia Bay on one end and South Beach and Wickaninnish Beach at the other, where you’ll find sandy beaches to make a perfect ending to your excursion. Found on Meares Island, where you’ll see some of the largest trees in British Columbia, and Big Tree Trail, and accessible by a 10 minute water taxi ride. The first trail is about 2.4 kilometres and ventures along wooden boardwalks and ends at the Hanging Garden. The second trail is about 4.3 kilometres long and follows dirt paths near the beach. It should be noted that you should have proper footwear as the paths can be muddy, and bring a cellphone so you can call a water taxi for pickup to get back to Tofino and off the island. The Lone Cone Trail on Meares Island is one of the more challenging hiking trails. A 15 minute water taxi ride to Kakawis brings you to the base of Lone Cone mountain overlooking the Clayoquot Sound, which is easily visible from Tofino and provides majestic views of the surrounding area once you reach the top. Since the trail rises 700 meters within 1.5 kilometers, be prepared for a challenge. Hiking along the Tonquin Trail is of medium difficulty, with boardwalks meandering through the forest and stairs in some sections. Along the Tonquin Trail’s 3km trek is a number of points of interest and viewing platforms, along with a lookout to enjoy Templar Channel and Wickaninnish Island. A popular trail that makes for a great family outing when visiting. The Wild Pacific Trail provides spectacular views and wildlife viewing along the ocean-side trail can be surreal, picturesque, and sometimes referred to as ‘postcard views’. 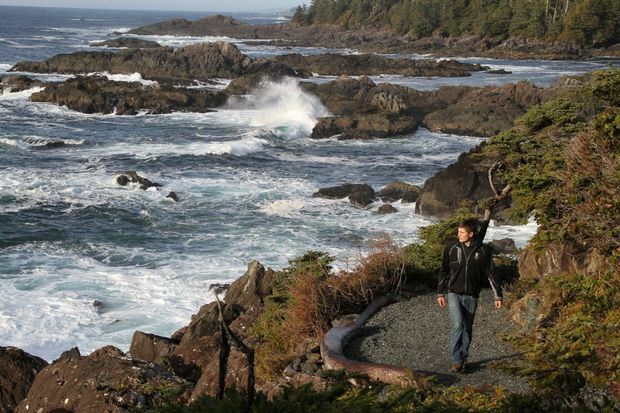 Found 40 kilometres south of Tofino and near Pacific Rim National Park, the nearly 9km Wild Pacific Trail resides near Ucluelet. With spectacular views of the ocean and migrating grey whales, depending on your timing. As you make your way past trail-viewing areas with crashing waves and carves through the old-growth coastal rainforest, the winding Wild Pacific Trail will enthrall visitors and has been ranked the top outdoor attraction in British Columbia by TripAdvisor. Take in the dramatic and panoramic views as you pass Amphitrite Point lighthouse and breathe deeply as you make your way through the Ancient Cedars Trail. Most of the trail has a dense rainforest canopy, but avoid during storms due to the dangers of falling trees. A day at the Wild Pacific Trail is mostly flat, very scenic, and one to be enjoyed by all.